Padding the Stats: Who Leads the Huskers in Sacks in 2017? In 2013, the Blackshirts recorded 38 sacks, almost three per game. That was good for second in the Big Ten. That team had a guy named Randy Gregory, who finished with 9.5 sacks. Avery Moss provided a strong rush from the other side as well, chipping in another 4.5 sacks as a secondary rusher. 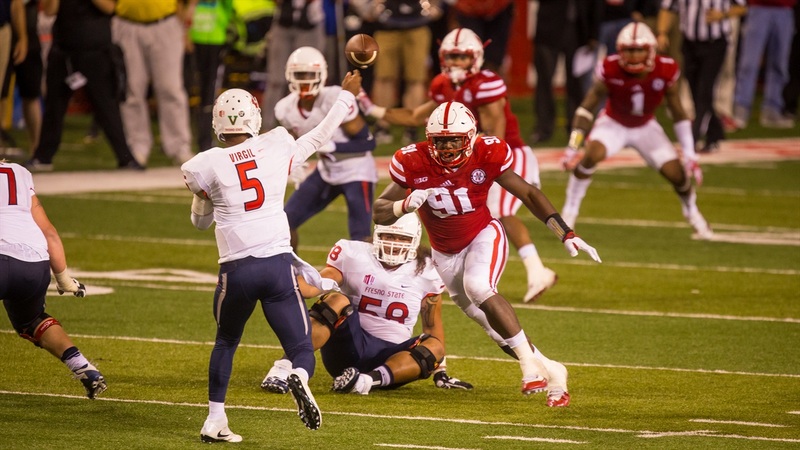 In the three seasons since then, the Huskers have mustered just 29, 24 and 26 sacks. Gregory had seven sacks during his injury-plagued final season as a Husker, and since then Freedom Akinmoladun (4.5) and Ross Dzuris (5.5) have been the sack leaders for the Blackshirts. Those are far from eye-popping numbers to begin with, and Dzuris has run out of eligibility. In fact, Nebraska’s second-leading sacker, Kevin Maurice, has also exhausted his eligibility after notching four sacks as a senior. The Huskers have obviously changed defensive coordinators and schemes, and some 3-4 defenses are known for their exotic blitz packages with rushers coming from every angle. However, based on the history of Bob Diaco defenses, that’s not what we’re going to see. In 2012, Notre Dame, under Diaco’s direction, racked up a respectable 33 sacks. The Fighting Irish followed that up with just 21 sacks in 2013. Star defensive lineman Stephon Tuitt was responsible for 18 of those 54 sacks, leading the team both years. Diaco’s defenses are more focused on eliminating the big play and containing offenses than it is about splash plays and extreme pressure. However, with both Nebraska in recent years and with Notre Dame under Diaco, a stand-out rusher can make a big difference. Diaco is still figuring out what he has at outside linebacker, the primary pass-rush position in a 3-4 defense. Marcus Newby and Alex Davis are currently sitting atop the depth chart, but the competition on both sides will continue into the fall. Newby played his freshman year as a pass-rush specialist, but he has since developed into more of an all-around ‘backer capable of dropping into coverage as well as he tracks down the ball carrier or gets into the backfield. There are a handful of candidates with strong pass-rushing backgrounds including 2016 scout team defensive co-MVP Collin Miller, redshirt sophomore Quayshon Alexander and true freshman Guy Thomas. But none of those players have even cracked the two-deep to this point, let alone proven that they can get to the quarterback at the Big Ten level. Nebraska’s top returner in terms of sacks is Akinmoladun, who finished with just three of them. That figure had to be a little disappointing for the coaches and fans considering the hot start to his career after switching from tight end to defensive end. Akinmoladun recorded 4.5 sacks in his first five games before an injury slowed him down the rest of the year and even sidelined him for three games. Since that injury, Akinmoladun has three sacks in 18 games, two of which came against Maryland last season and the third against Illinois. Akinmoladun has not been able to get the quarterback down to the turf, but that doesn’t mean he’s not getting into the backfield. In fact, on Thursday, Pro Football Focus’s college account tweeted out some praise for the junior. Pressures are certainly nice, as they speed quarterbacks up and give them something to think about as they’re trying to throw. However, even while pressured good quarterbacks will complete passes. Akinmoladun doesn’t quite need to hit double digits in terms of sacks like Tuitt did as a sophomore for Notre Dame, but he does need to start turning some of those pressures into sacks. Akinmoladun has plenty of talent and has shown he’s capable of being a difference-maker in the past. Now it is time to become one consistently. Another player to keep an eye on is redshirt sophomore Carlos Davis, who is slated to start opposite Akinmoladun at the other defensive end spot. He flashed some impressive potential and recorded two sacks as a freshman. Again, Davis is not likely to post Tuitt-esque numbers, but if he’s able to burst through the line at key moments – which is something he’s shown he is more than capable of – the Huskers should be able to get off the field on third down at a consistent rate. Nebraska is strong enough in the secondary and at inside linebacker to get stops so long as opposing quarterbacks do not have forever to stand in the pocket and throw. While linebackers coach Trent Bray and Diaco build up the young outside linebackers and hopefully find the next great edge rusher at some point, the Huskers will need a strong interior pass rush from the defensive ends. Can Akinmoladun and Davis make that leap? Only time will tell.